You can read and read about the different things that will make your teeth dull. Expore and think about the solutions. But first come and see us and ask. We love smiles and we love to see the joy a bright smile can bring to others. Contemporary dentistry offers lots of different options and exploring them together may save you stress and precious worrytime. 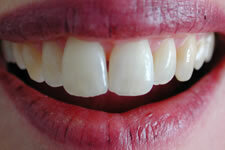 What determines the color of our teeth? Why are my teeth are getting darker! Baby teeth are lighter than permanent teeth. There is a genetic reason for this. It makes parents tell their children that they should be cleaning their teeth better in the crucial age of 6 - 8 years. Once all the permanent teeth have erupted the contrast is no longer present. The colour of your lipstick will also influence the colour of your teeth. Try a pink-based lipstick verses an orange-based lipstick. There can be a quite noticeable change in your tooth colouring. 1. External stains. Eg medications, tea, coffee, colas, red wine, smoking and even extended periods in the swimming pool! 2. Thinning of the enamel. Sorry, age and excessive tooth brushing (too little brushing will cause gum problems and external staining!) can do this. 3. Drugs. Some antibiotics taken when the teeth are forming cause an internal layer of the tooth to become quite darkly coloured. Come and see us for a complete dental examination and ask us about whitening your teeth. External stains may be removed by our professional cleaning. Options for tooth whitening can include: renewing white restorations (fillings), veneers, crowns and bleaching. Bleaching will be great for lots of people but we really need to discuss aspects of it. White restorations, veneers, porcelain and crowns are not made whiter with bleaching and often drug-stained teeth are difficult to bleach. Bleaching is not recommended for pregnant or lactating women, children under the age of 14 years or smokers. 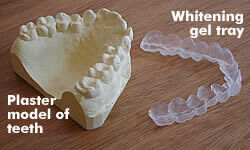 Provide you with a custom-sized mouth tray (this holds the whitening gel against your teeth). We aim to minimise the contact between the gel and the gums. The customised mouth tray is a bit like a thin mouthguard. Clean and floss your teeth. Apply small amounts of whitening solution towards front of each tooth impression of the teeth that need whitening on the tray; overfilling tray will result in unnecessary waste of product and you may not have enough material to complete treatment correctly. Place the tray in your mouth (as we will have discussed) and wipe away any paste from the gums or gum line. Remove the tray and brush your teeth with a wet toothbrush to remove any whitening gel. Rinse the tray in running water using your wet toothbrush to remove any remaining gel. Between treatments store your tray in its storage tray. Refrain from eating and drinking during, and for thirty minutes after treatment. Use only under the supervision of a dental professional. Store whitening syringes and mouth trays under 25 degrees. DO NOT rinse trays in hot or warm water. DO NOT freeze trays or bleaching solution. If discomfort or sensitivity occurs contact the dentist for advice.